Entrance to Yeonji Korean Restaurant. 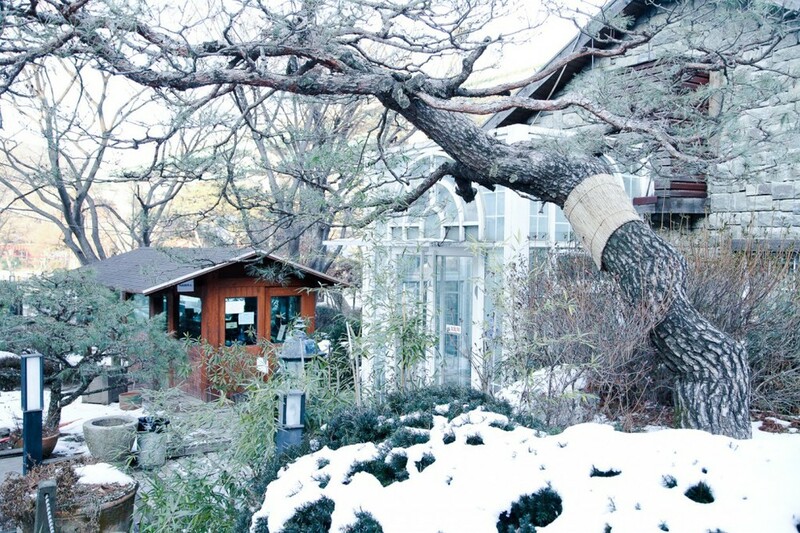 In a neighborhood detached from the busier part of the Yongin city sits unassuming restaurants. Exteriors appear bare and camouflage into surrounding snowy mountains. Yeonji Korean Restaurant is one of these eateries. Yeonji offers set courses. The lunch course is ₩15,000 per person and is more than enough food. 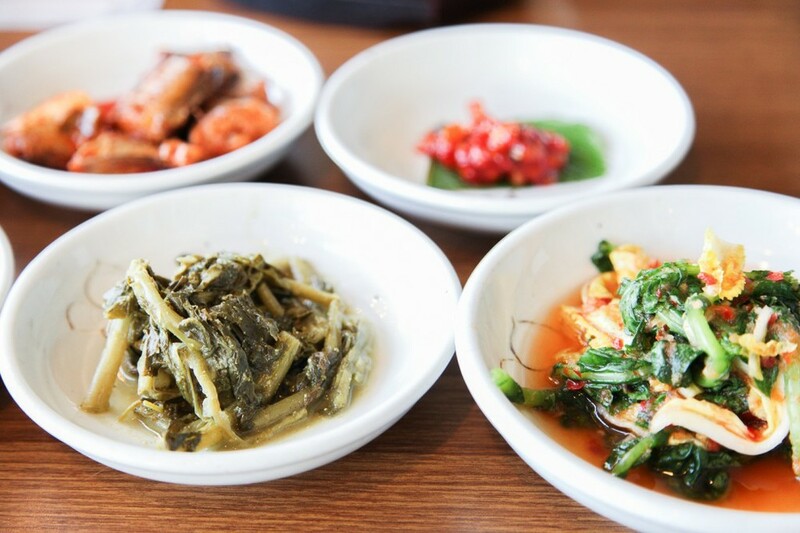 You get porridge, jellyfish, salad, pancake, japchae, fish, banchan and more (see below for all photos). For an extra ₩3,000 order Course A to add on bossam (steamed pork) and fried octopus. The pricier courses offer additional dishes, however I recommend you grow another stomach first! Only a small handful of many banchan. The courses are served one to two dishes at a time as opposed to your whole meal placed on the table at once. Because of this serving system, you end up finishing the beginning dishes clean and become full in the first half of your dining experience. When the waitresses didn't come for awhile, my food buddy and I thought we finally reached the end of our meal. Then came the rainbow of sidedishes, stew, stone bowl of rice and other goodies. 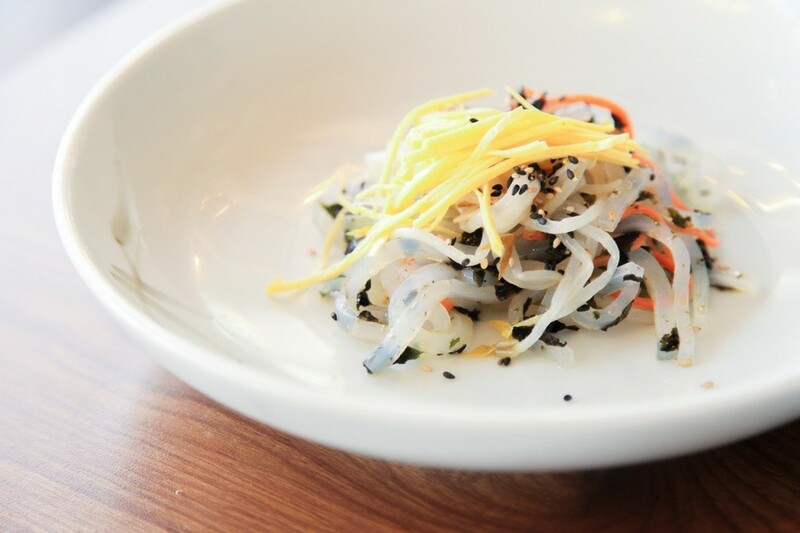 Looks like kelp noodles, but it's actually a Cold Jellyfish Salad (해파리냉채). Spicy due to the hint of wasabi. I've noticed many Korean restaurants have a tendency of serving iceberg salads. It's quite sad as this lettuce contains little nutrition. However better to eat iceberg lettuce than a triple fried hot dog. At least the iceberg salad at Yeonji is embellished with a pinch of sprouts. Perilla leaves are an acquired taste. However the Perilla Seed Salad (들깨샐러드) can be enjoyed by many customers. Only a hint of perilla leaves. Not overpowering at all. The mild to medium spicy Seasoned Raw Fish (회무침). Many rice cakes I encounter have a tough and chewy texture. Yeonji's Rice Cake Japchae (떡잡채) has a delightful softness. The Fried Octopus (낙지볶음) with perilla leaf salad. If the octopus is too spicy, district your taste buds with the herby perilla. 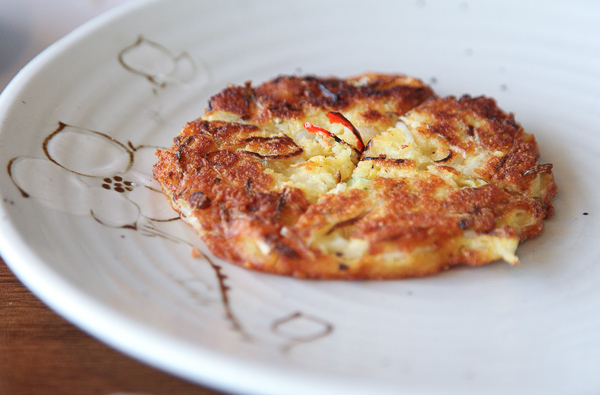 The crispy yet bland Mung Bean Pancake (녹두전). The oh-so-juicy Beef Patties. One of my top favorites from Yeonji Restaurant. Banchan, banchan, banchan... Never enough banchan. Anchovy and kimchi on the top, eggplant and spinach on the bottom. They don't serve too many slices of Bossam (보쌈), but what they give you is enough considering all the other dishes to consume! The garlic chips are a fun concept, though I'd prefer crunching on them while watching a movie rather than pair it with my bossam. There was also the Seasonal Soup (계절탕), which was made of rice cakes and mushrooms. At the end of the colorful feast, our waitress brought us maesil tea. It's typical to drink a dessert drink at the end of a hansik meal. Walking by Yeonji on the main road.